Straight to the point, huh? Well, loveys, it is that glorious time of year. The time of year that you can support your local handmade shop owner and get some awesomeness! Some HANDMADE awesomeness at that! I asked a few of my favorite shops to come by and show you their stuff. You'll fall in love and want to get someone on your list one or all of the goodies these loveys have to offer. Or browse around until you can't take it anymore. PidgApeg: (the softer side of jewelry) I think you realize I don’t really wear jewelry but if I did I would wear these pretties. I keep my prices low because I want it to be affordable to everyone. My quality in supplies is as good as the over-priced shops but I being OCD will keep my shopping cart full for a week as I compare prices, quality and quantity until I get the best price for both of us. In addition to that I charge less for labor only because I love my job; which is creating for others. Alyssa Dawson Design is a crochet shop that started off as an idea. The name changed quite a few times and throughout the years Alyssa Dawson Design progressed into something real. Alyssa Dawson Design officially launched in August of 2012 and has been a blessing ever since. I started crocheting for fun, fun turned into love and eventually you never saw me without my trusty crochet hook. 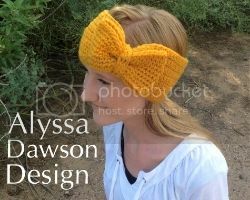 Alyssa Dawson Design is a shop where I sell crochet ear warmers, dolls, and coming soon boot cuffs and cowls. I love crocheting! The Foley Fam Shop I started making pretties when our 1st daughter Maggie was born, it's turned into one of my greatest passions. I love seeing my creations on other beautiful babes and mommies. Such a humbling journey this has been opening up my own handmade shop. You'll find an eclectic mix of handmade goodness for ladies, sprouts, and your home. 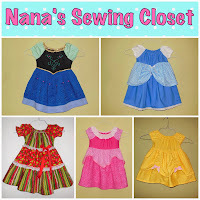 Nana's Sewing Closet specializes in homemade dresses for the little princess in your life. Nana makes Disney princess inspired dresses of all your favorite characters, holiday dresses, birthday dresses, if you can dream it Nana can make it. We have a Facebook page and will be offering deals on Black Friday! The Lovebug Collection is an online boutique offering baby clothing, hair accessories, baby essentials and more! We are adding new items every day so be sure to check our shop often. You can also follow us online on Facebook | Twitter | Instagram | Google+. We hope to see you soon! Thank you Mama for featuring me... always faithful ;) You've got a good collection going on here! Love homemade! Thanks for introducing me to some new shops!